Ok, some of us can’t afford to drop a few grand on a new gun safe, some of us are just cheap…I guess I’m a little bit of both. 🙂 I found a goodly sized gun safe on Craigs List that I literally traded my old computer for. 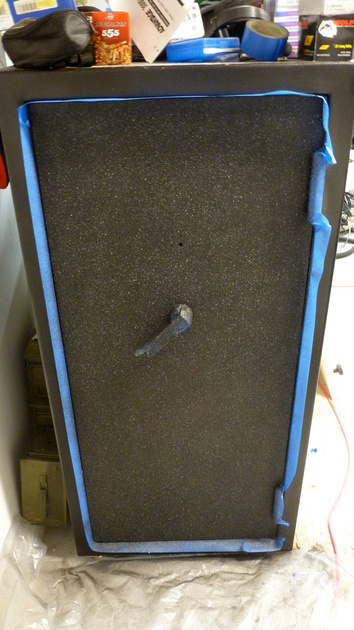 This is Part 1 of a multi-part Gun Safe Refurb. In later parts I’ll show the digital lock I installed, custom interior I’m designing and building, and the lighting feature for this safe. But for now, let’s see how this project is progressing, shall we? I’ll not bore you with the story of me pushing a 550lb safe up a flight of stairs and the hernia that resulted. Nor how I fit a 22 gun safe in my little Scion XB and the rear window getting knocked out while driving over railroad tracks. But I will say that I was pleased with the trade, at the cost of an old computer, some torn muscles, and a new rear window on the car. So far this cost me about $180 for the new rear window (the computer was “retired” so really had no value to me). First things first, lets clean up this door. This insulation on the *outside* has to go, and I’m not a fan of name brands emblazoned on the things I own…no offence to Browning, just not my thing. Unfortunately, the adhesive on the weather strip did a good job of soaking into the textured paint/powdercoat on the door, so peeling and shaving it away with a razor left me with bare metal. Not a pretty sight, but hopefully some sanding and the tried and true Rustoleum Hammer Tone will fix this up. Fast Forward a bit, after lots of sanding with the random orbital and some 80 grit. It turns out, hammer tone finish wasn’t enough to cover up the hard edged transition between the factory finish and the adhesive damaged finish I stripped away. So I came up with another clever idea, and ran out to the local hardware store and picked up a stone texture type finish which would cover up the rough looking door. This gave me a great base coat to put the hammer tone finish on and finally started looking like I might know what I was doing.